There are several tools and including browser extensions that can be used for downloading images from web pages. Some times browser extension work very well in downloading galleries present in web pages. But if you want download each and every picture uploaded to a blog or site the options are limited. Tumblr recently acquired by Yahoo is a free blogging tool as well it is used by many to share photos, text and what not. Tumblr is also place for some good blogs focused on pictures alone. 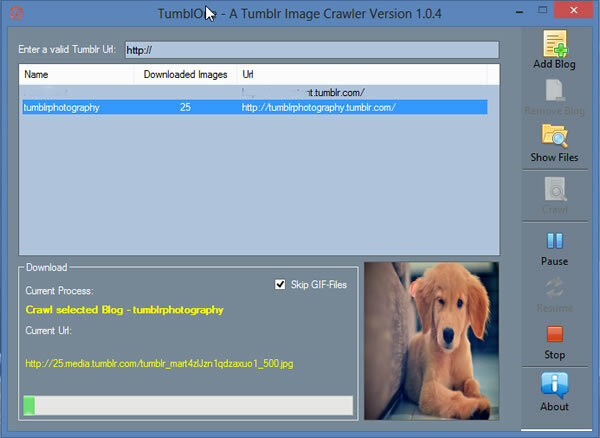 TumblOne is a free software that is designed to download photos from Tumblr blogs. It doesn’t offer any other functionality all it does is crawl a tumblr blog and download images from that blog as it finds. The program footprint is small and is a executable program meaning you can just fire up the program and start using it with out installing to your system. Download TumblOne and extract files to a directory where there is enough space to store downloaded photos from tumblr blogs. Open the program and you will find limited set of options and a simple UI. All you have to do is enter tumblr blog urls in the URL field and click “Add blog”. You can add multiple blogs in the window, but you can crawl and download images from one blog at a time, once it is finished you can start with another blog. After adding the blog, select and click crawl to start the download process. The program crawls the specified blog and downloads images it finds along the way. The downloaded images are stored in the TumblOne directory under blogs directory. Apart from adding blogs and crawling there are not many options to choose. The program is simple and does what it claims effeciently, that is batch downloading images from Tumblr. Give it a try if you want to download pictures from your favorie tumblr photo blog.